An update: The Detailed Preliminary Programme for GSDI 10 in Trinidad (Feb 25-29, 2008) has been published. I've been digging around this topic, and though it's not singularly a "GIS" one, a GIS is an Information System. So, I asked, who runs on Free or Open Source Software (FOSS)? Just niche users and rebels without a cause? - The GNU/ Linux operating system drives many PCs and servers. LAMP servers, which combine the Linux OS, Apache Web Server, MySQL database and PHP/ Perl/ Python programming languages, are a well established solution for hosting companies. Supercomputers run on Open Source too! In fact, it seems most of them do. GNU/ Linux powers over three-quarters of the world's fastest supercomputers including the 8th-ranked US's National Centre for Supercomputing Applications Abe, the 9th-ranked Barcelona Supercomputing Centre Mare Nostrum and 10th-ranked Germany's Leibniz Computing Centre HLRB II. But who uses Open Source? Answer: Yahoo!, Google, Amazon, Flickr, YouTube, Wikipedia, Facebook, the New York Times, the BBC, your PlayStation and various mobile phones. It will seem obscure if you don't manage servers, but here's Open Source software developed by the NY Times. On the user-side, the Firefox web browser, Thunderbird mail client and OpenOffice office suite are all Open Source. The point made in the previous excerpted article, that the Caribbean needs to invest in FOSS, is very well supported. I mentioned in a previous post that there were free training courses being offered for a few open source GIS software packages (registration for these courses is now closed). I decided to give one course a spin and experience what it is like. First off, the courses are delivered through a web-based open source software called Moodle. I am pretty impressed by this package. It is quite intuitive though they should replace the default theme with a better one. There are also many places where it can be improved esthetically. The course I opted to take is DIVA-GIS. The website ain't great but the software is. This is the fourth week into it and I'm quite impressed. It's true that it can't do all the fancy stuff ArcMap or ArcView is capable of. However, for basic GIS tasks it does it for free and it's way faster than ArcMap. One thing I noticed so far is its built in capability for working with meteorological data. Those working in the meteorology/environmental field may want to give it a spin and consider taking the free course if it is offered again next year. Even if it's not offered again, the software is pretty intuitive. Two Caribbean nations have settled a maritime boundary dispute at the Permanent Court of Arbitration (PCA) at The Hague. The Arbitration Tribunal Award 'establishes a single maritime boundary between Guyana and Suriname that differs from the boundaries claimed by each of the Parties in their pleadings before the Arbitral Tribunal' (PCA Press Release Sept 20, 2007). The map at left is the Tribunal's Delimitation Line in the Territorial Sea and it and other maps and information may be found in the Award. The Tribunal was constituted in accordance with the UN Convention on the Law of the Sea (UNCLOS). According to Wikipedia, the UNCLOS is 'a set of rules for the use of the world's oceans which cover 70% of the Earth's surface'. Seventy percent! When you think about it that's a reminder that whatever I've done in GIS so far, is really very little! The Convention came into force in 1994, and to date, 154 countries and the EU have joined the Convention. The United States has not joined. The PCA had dealt with another Caribbean maritime dispute in 2006, between Barbados and Trinidad & Tobago, 'relating to the delimitation of the Exclusive Economic Zone and Continental Shelf between them'. Teaching in an academic environment and research agenda acquired in a surveying department. Ability to manage large groups at undergraduate level, publication record. Land Surveying with an emphasis on the numerical aspects including Geodesy and Adjustment. 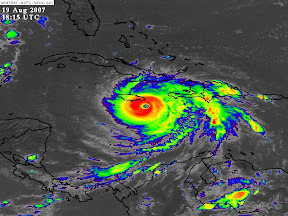 Hurricane Dean has reached Category 4 (NOAA Hurricane Center, 21:30 AST). 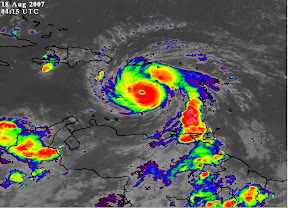 Dominica, Saint Lucia and Montserrat felt its impact as the storm developed. But now Jamaica, Hispaniola and points east and north stand in harms way. Some countries have decided to request assistance in the form of pre-positioned teams - a prudent and commendable action. In terms of GIS, MapAction is readying itself to deploy to the region, to provide situational mapping assistance to the UN and National Emergency Management Agencies. If anyone can offer assistance in terms of available data that can assist a presumed disaster-response, do get in contact. The Virgin Islands Geospatial Information Council (VIGIC) has scheduled its Third Annual GIS Conference this year for Nov 14 - 16, 2007 at the Wyndham Sugar Bay Resort on St. Thomas USVI. Themed “Empowering A Community of Users: Building A Strong Geospatial Connected Network Throughout The Caribbean. Advancing Policies and Best-Practices,” it is designed to promote the expansion of internal and external resource capabilities to improve knowledge and resource sharing. This year’s conference aim is empowering citizens, practitioners, technical experts, governmental staff, and a host of other equally critical partners in becoming involved. The 2006 conference presentations are pretty interesting and can be found here. This event along with GSDI 10 in Trinidad in Feb 2008 and the 4th Caribbean GIS Conference in the Caymans in Aug 2008, makes three GIS conferences in the Caribbean over the next 12 months. USVI's Height Modernization Project and related applications - flood plain mapping, storm water and sewer utility management, large scale engineering projects, hurricane evacuation and recovery planning, and topographic mapping - are likely to be featured. Few nations' IT sectors can compensate for major environmental weaknesses. India and China have been able to parlay unique factors, such as workforce size, low wages or language attributes, into strong IT sector performance, compensating for glaring weaknesses in the industry environment. Few other countries will be able to use similar factors to replicate China’s and India’s success — improvement across all the enablers of IT industry competitiveness is required to build strong IT sectors. Do Caribbean governments or the anglophone political bloc have an IT strategy for the region? (Only Guyana has drafted an IT Strategy - though hopefully I'm wrong). How does building an SDI for the region proceed in such an environment? Global Spatial Data Infrastructure (GSDI) 10 will be held in Trinidad on 25-29 Feb, 2008, at the University of the West Indies St. Augustine Campus. Design and development of depositories, portals, and registries for geographic data, metadata and services. Innovative methods for addressing technical, legal, economic or institutional challenges in implementing spatial data infrastructure concepts, components and systems. Experiences with current spatial data infrastructures at local,regional, national and multi-national levels and their evaluation. Emerging participatory, inclusive or collaborative approaches in developing content and building infrastructure (examples: PPGIS, GEOSS, UNSDI, Google Earth, Virtual Earth, data commons, open source software). Challenges and approaches to standardization of data and interoperability of systems. Barriers to sharing data and methods for achieving success in sharing. Alternative methods and models for planning, financing and implementing spatial data infrastructure or related initiatives. Policies supporting creation and responsible management of spatial data infrastructure resources. Progress achieved by developing nations through information infrastructure development efforts. Facilitation of international support for the development of spatial data infrastructure. Analysis of practical cases to determine whether infrastructure initiatives are actually achieving goals such as increasing efficiency and effectiveness in the management of information or helping to advance health, education, social welfare, security, safety and similar social goals. Education and capacity building efforts. Basic and applied research in advancing spatial data infrastructure theory and concepts. More information: Full Call for Papers. Two page poster. The Integrated Watershed and Coastal Area Management (IWCAM) Project, based in Saint Lucia is forging a good foundation for GIS and its application to the management of water resources and related issues in 13 Caribbean states, stretching from The Bahamas to Trinidad & Tobago. The IWCAM today ended a two-day Regional GIS Workshop in Roseau, Dominica where a draft Roadmap for mainstreaming GIS for watershed management in the Caribbean was presented and widely discussed. The results of the workshop are not yet formally available, but the Caribbean's GIS sector will likely benefit from the many good action-ideas that IWCAM is now seriously considering. The IWCAM Project Coordination Unit is to be congratulated for its action on pushing the application of high technology to better manage the precious water resources of the region, to the benefit of its people. Though well-considered, the Caribbean SDI Resolutions (66KB Word) are still essentially draft and not ratified by any regional authority. URISA has hinted that the 4th Caribbean GIS Conference will be held on Aug 25 - 29, 2008 in the Cayman Islands. It'll be interesting to see what progress has been made with GIS in the Caribbean since the 2006 Conference. As forewarned by Raj, ILWIS is now freeware; along with a few useful specialised geodetic utilities. Challenge of the Prize: The best SDI realization using UNSDI and INSPIRE principles with respect to sustainable regional development and rural knowledge society building. The best three applications will be awarded by certificate and trophy. Information about all eligible applications will be published on CDs, about awarded applications also on Conference pages, EFITA and UNSDI and INSPIRE pages. The overall purpose of the Joan Blaeu @ Prize, established in the context of the UNGIWG-UNSDI and INSPIRE programmes, is to select examples of best practices in applied Geo-informatics, with emphasis on underdeveloped rural and suburban areas and their population. The reason, why rural and suburban areas were selected for the 2007 Prize is, that rural regions are usually and particularly in the technological sense, underdeveloped, the main focus being generally on development of big cities. The rural areas cover 80 percent of Europe and coverage of other continents like Africa, South America and Asia is higher. Most of environmental applications are also related to rural regions. So there is chance for exchanges of experiences among countries and regions. The aims of the Prize are: to promote existing, in fact working, accessible and intelligible solutions, based on open technologies and standards, to minimise the negative impacts of e-exclusion in society, to improve the overall knowledge of the applied geo- and environmental sciences, to support inexpensive yet complete solutions, and effective working groups. Geomatica 2007 will be held from 12 - 16 Feb 2007 in Havana, Cuba with workshops, conference presentations, round-table and panel discussions. GEOCUBA has made the Scientific programme (85KB PDF) available. Ready or Not - II? Dr. Garfield Giff of TU Delft recirculates a modified study of the state of readiness of SDI (Spatial Data Infrastructure) of countries in Latin America &amp; the Caribbean; i.e. the degree to which a country is prepared to deliver its geographical information in a community. Download the questionnaire to participate (instructions inside). NOAA Fisheries Service (NMFS) has provided its Draft Strategic Plan for Fisheries Research (1.9MB PDF), for public comment. NMFS seems to be expanding its use of GIS ... with efforts that 'include mapping, spatial analyses, geographic information systems (GIS), and fishery and ocean habitat modeling and characterization, as well as an evaluation of ecosystem approaches to focus on spatially-explicit models and further research into food web relationships', and amongst other things intends to '[establish] GIS databases to document and track habitat changes'. (Thanks Eric Linzey). Great news for ILWIS users!! From July 1st 2007, ILWIS will be distributed free of charge. For those unfamiliar with ILWIS, it is a remote sensing and GIS software developed by ITC. The URISA 2006 Caribbean GIS Conference Proceedings are now available. Conference attendees would have been informed how to download them directly from URISA (63.8MB zip file). Inquiries are probably best directed to Scott Grams, URISA Education Manager (+1 847-824-6300 or sgrams at urisa.org). Data Protection is certainly something every Information Systems professional is conceptually aware of. The matter is however wider than just ensuring that one's data are (occasionally?) backed up. It's an oft-stated estimate that data (gathering, processing) constitute around 80% of the cost of GIS projects, so data are the most valuable part of a GIS. Since GIS deals with real world situations then one's spatial data are also important in that they affect people. Notwithstanding this importance, there are few regulations guiding GIS practioners and protecting the public interest. A search of CARICOMLaw (operated by the CARICOM Office of the General Counsel and the CARICOM Legal Drafting Facility) reveals, as yet, no legislation on this matter. The only recent reference found to Data Protection is from the Barbados Advocate newspaper, which on Mon Nov 6, 2006, reported on a Data Protection Bill for the island state whereby ... 'the collection and dissemination of sensitive personal information on databases would be regulated under the legislation'. The legislation is meant to 'protect people's privacy', and one can certainly see the good purpose in that. Though many GISs in the region may not deal directly with personal data, the pace of change in today's world and the subtleties arising when datasets are combined in new and powerful ways mean that GIS professionals should keep a weather eye out for unintended consequences. A cadastral GIS (LIS) that swiftly identifies the owner of a parcel of land is an excellent public service. However, one that allows all parcels of land owned by an individual to be equally easily identified by a member of the public, is facilitating invasion of privacy. So, Data Protection should be part of the best-practice view of GIS practitioners. The British Data Protection Act (1998) offers one starting point for GIS practitioners who may wish to find out more. One best-practice implication that I make from a principle in that law is that since LISs hold data pertaining to individuals, then LISs are responsible for protecting their data from accidental/ catastrophic damage or loss, so as not adversely affect the lives of individuals listed in the LIS. E.g. Land Title records may be involved in loans, sale of property, inheritance, startup of new businesses/ investment, compensation for damage during a natural disaster, etc. and so their continuous existence is important to individuals and society. The data subject can make a request for a copy of the information. Barbados will also require that 'information should not be transferred outside of Barbados unless that country or territory ensures an adequate level of protection for the rights and freedom of the data subjects in relation to the processing of personal data' (Barbados Advocate). I therefore anticipate that all countries in the CARICOM Single Market & Economy (CSME) will at some point harmonise on similar principles. This topic could certainly be discussed further and I hope persons will contribute their knowledge of what obtains in their part of the world.